Your waiting room is the eyes to your office your office’s first impression so you want the waiting room to be comfortable and visually appealing. Whether you want individual seating, sofa seating, formed waiting room chairs, chairs with cushions or tandem seating, we have the type of seating you need. Browse our large selection of office furniture, and let us help you choose the perfect style and color for your waiting room chairs. Many people bring their tablets or laptop computers with them when they need to wait, such as a doctor’s office or attorney’s office. 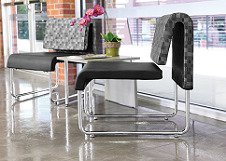 Our selection of mesh, leather and other guest chairs provide comfortable and stylish seating with options including stacking chairs or a small table on each chair so that your clients have a place to set their electronics. For waiting rooms where space is a premium, we offer guest chairs which may be the perfect fit. You can choose your fabric and wood color when you order these stylish waiting room chairs, so you don’t have to plan your decor around the chairs. Plan the chairs around the decor!